Another crazy miniature stories from my head.... My friend thinks I should put up a new blog for all those tiny stuff. The ketchup bottle is empty. Barbie wanted to use it for some burgers but then she has to resort to noodles again. Good thing her aunt sent over some fresh croissant. It took me days just to make the miniature bread from paper clay. I had to let them dry overnight and paint them. Crocheting the baskets and napkins is quite easy. 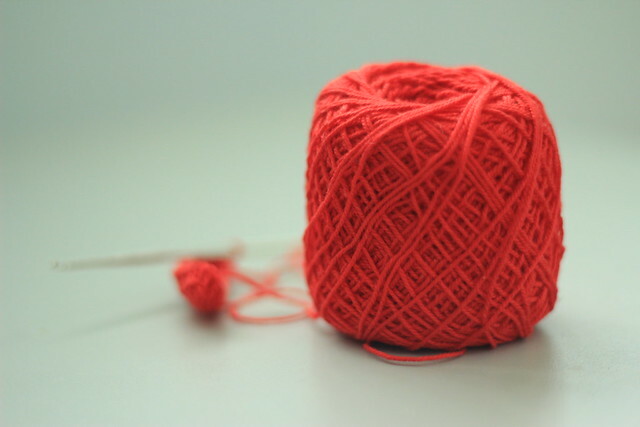 The only challenge is to be patient with the skinny threads and make sure you have big enough eyes to see where the loops are. My sis thinks my there's madness in my room after she's seen all those papers and little things I've collected. My mom thinks I'm crazy but she agreed that she would probably have done the same if not for other important things. When I was a kid, my mom made me a doll house and painted it white. I wished we finished it. We were caught up in life. Someday, hopefully we will. Apparently, I am not a big fan of car racing unless I find a very good reason to be one. While the rest of the world was watching the race, I succumbed to my comfortable mattress to finish Season 2 of The Game of Thrones. I guess that makes me a nerd though I've been one since I was a kid and only admitting it now. The snow-covered mountains of "The North" reminded of Northern California in winter time. Reviewed some of my old photos and decided to paint. If I could just put a fairy somewhere near the trees then it would look like a fantasy scene but decided not to spoil it. My images of fairies are too complex that I'm still having a hard time laying it down on a flat paper. Meanwhile, my dolls were waiting for me to be played with but not in a pervert manner. When I was a kid, my sister and I had those kitchen and bedroom sets where we pretend Barbie and friends would come to life. Playing with dolls is much more different now that I am adult. 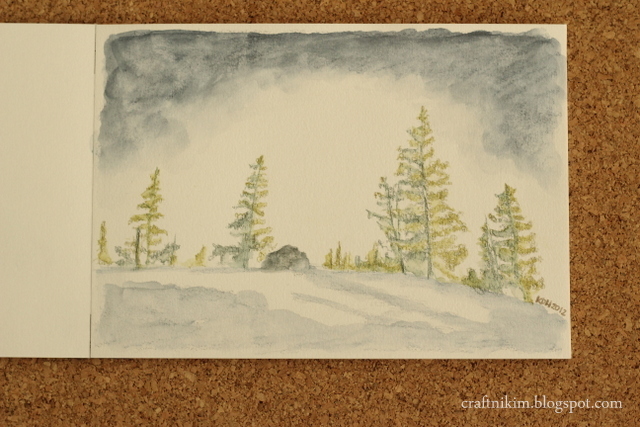 It's more of making miniature pieces and taking photos of them. I'm glad Barbie never had a problem posing for me. If it had been a real model, I would have already failed at initiating a conversation with her. 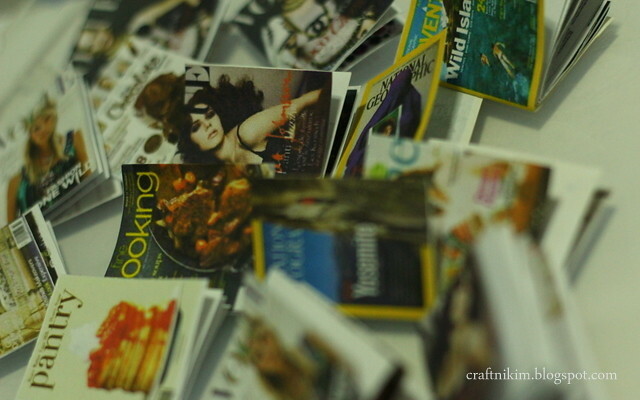 A few weeks ago, I printed out some miniature magazines. When I posted them in Facebook, most people thought they were life size. I'm not really in hoarding magazines though I have bought a few to serve as my references. Barbie couldn't decide which magazine to bring along with her. She needs to meet someone at the park and thought that some reading material would do her good while waiting. And off Barbie went. J-doll stayed at home all dressed up. She's never changed into anything else since the day she lived with Barbie. 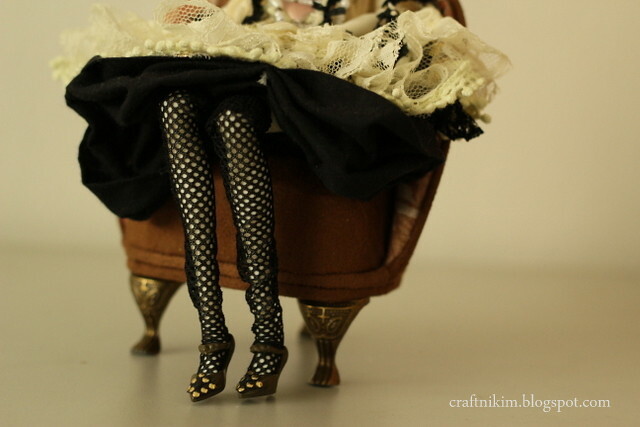 She sat on the sofa and I saw how picture perfect her stockings were. These stockings has got to go eventually. I have a casual outfit planned for her but I haven't started sewing it yet. Mail finally arrived and was so happy to picked them up Saturday morning. Weekend started with so much excited after opening the packages. Guess I need to have my creativity engine to keep going. So much stuff means a lot of things to do. Meanwhile Sunday turned out to be boring after a day's merrymaking in the flat since it was my friend's birthday party. 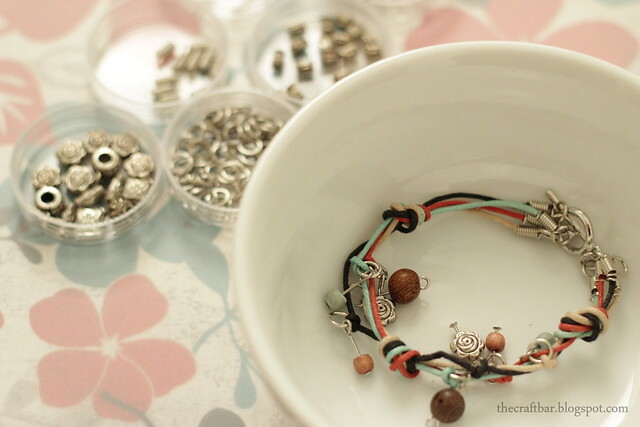 So after lunch I decided to pick up my pliers and started twisting and trimming pins for a not-so-simple bead bracelet. 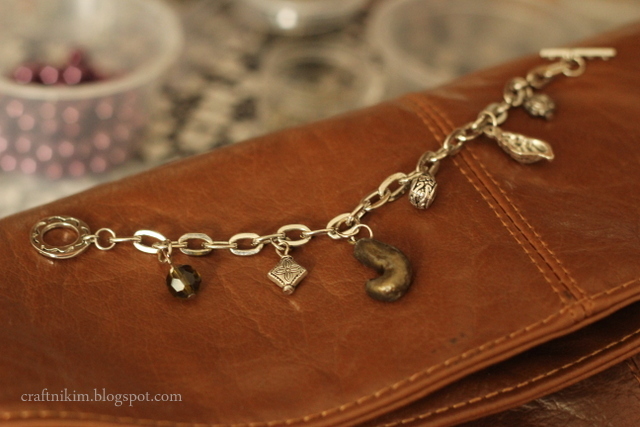 The materials are not expensive but this bracelet is definitely something you can wear with a dress. The final bracelet turned out to be dominantly purple which I think is a good thing since i never had much of this color in my wardrobe. 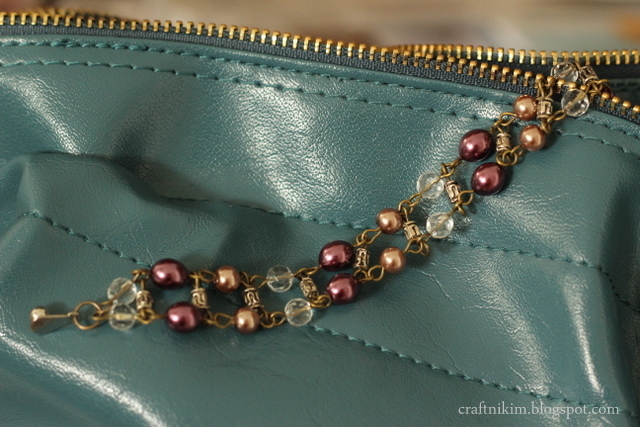 The bracelet complements the teal leather on my bag which is another plus. I like this bracelet though 'm not sure if I'm going to keep this, give it away or sell it. For now, it will be kept safely in my collection until I come to a decision. Of course, my dear friend's birthday can't go by without me making her a piece of jewelry. I got some clay, formed a letter bead to represent her initial and concocted some sort of gold color from my paints. My friend likes two-toned jewelry so I'm glad the gold-colored bead and the brownish crystal mixed well with the rest of the pieces in the charm. My sister thinks my room is like that of a teenager's. I strongly contest. My dolls, beads, papers and pen are what define me when I'm not doing my day job. What else would I be if my job would be suddenly taken away from me? The rain has poured madly this morning and I was left with not much light today. 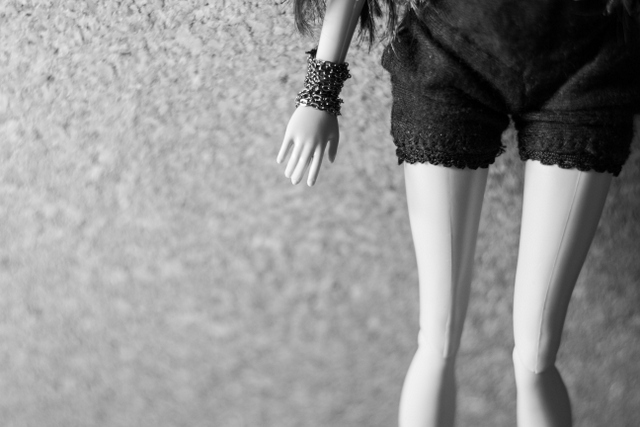 Good thing that there was enough sun yesterday to sew some clothes for Barbie and take photos of her. Black and white turned out to be better since there wasn't much coordination between the flooring and the wall. I would still want to share this Barbie ensemble in full color since the metals and the beads actually look good against her black bag and shorts. I'm like a kid I know. But it was actually my mom who influenced me the most. 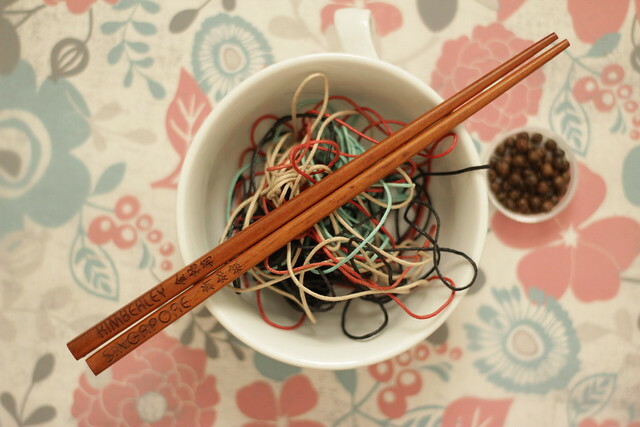 We could sit down together and string beads while talking over crafts and dolls. I've never been to this place called Tuscany but this writer featured on National Geographic Live made the place sound very idyllic. Took my pastels and overcame the intimidation of a blank paper. The drawing is my version of those photos on the internet that show up when you look up Tuscany. It's unfinished but I think less is more. My craft life felt like a lonesome yarn in those 8 months since my last post and this is the first for this year. I realized I couldn't be everywhere so from this day forward, both my craft and art stuff will go into this blog. There is not much to say about art anyway. The image usually talks by itself. Wish me luck. This blog needs serious rework. But for now, I just need to blog more. I know there is a lot to talk about. You'd be surprised. On another note, my friend and I have been busy on another craft blog, The Craft Bar. I know this is another piece of me scattered somewhere. But this other blog has been born out of a dream. It is young and it still has a long way to go before it gets a place in cyberspace. 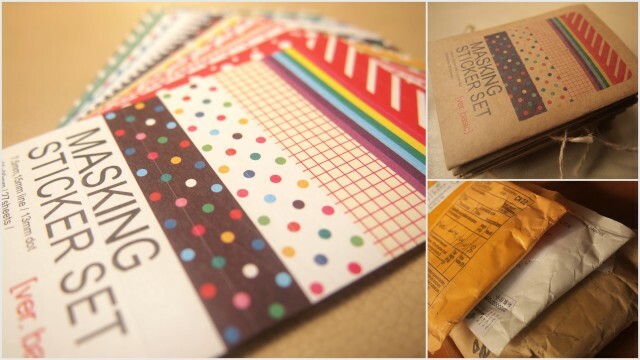 Do drop by and give us a hug: http://thecraftbar.blogspot.com.